Model 2660 Direct Drive Micropositioner is an electronically controlled direct drive micro stepping positioner ideal for high penetration velocity with exact actual movement of the probe. The Probe drive assembly is designed to support linear movement with travel range up to 25 mm. The probe is motor driven and has zero creep and zero backlash. Probe design incorporates a pin for grounding. Probe drive assembly incorporates a 15 foot cable for connecting to the Electronic control assembly. Electronic control assembly is designed for continuous motion speeds (run mode) that can be pre-selected up to 10 pre-defined speed settings with ranges from 1 µm/sec. to 4 mm/sec. Rapid single motion (burst mode) travel range: from 0.1 µm to 99.9 µm with resolution of 0.1 µm. The burst movement may be accomplished at either 2 mm/sec. or 4 mm/sec fixed speeds. Model 660-Y1 Probe Clamp Holder is included for easy attachment to any Kopf manipulator. 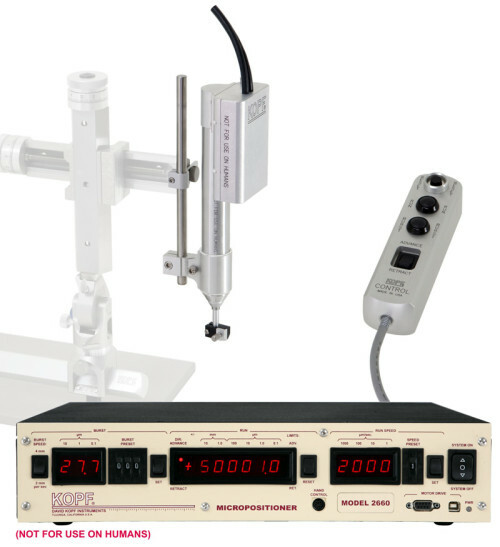 Model 660-Y1-IN Insulated Probe Clamp can be supplied for electrically isolating the probe. Model 2660-S Probe Drive Adapter for custom electrode clamping devices.